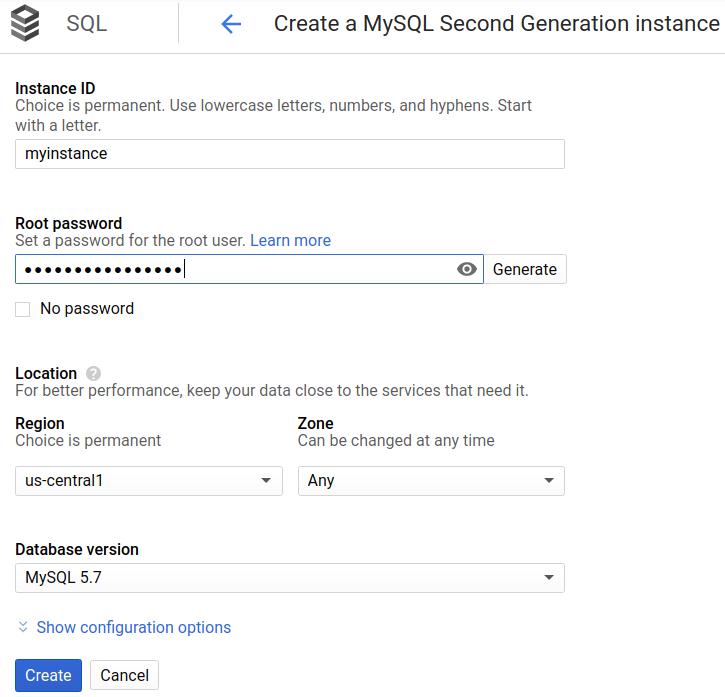 This page shows you how to create and connect to a Cloud SQL MySQL instance and perform basic SQL operations using the Google Cloud Platform Console and the mysql client. Important: You should be aware that some resource identifiers (such as project IDs) might be retained beyond the life of your project. For this reason, avoid storing sensitive information in resource identifiers. Enter myinstance for Instance ID. You are returned to the instances list; your new instance is greyed out while it initializes and starts. In the Google Cloud Platform Console, click the Cloud Shell icon ( ) in the upper right corner. Select the myinstance instance to open the Instance details page. In the icon bar at the top of the page, click Delete. In the Delete instance window, type myinstance, then click Delete to delete the instance. You cannot reuse an instance name for approximately 7 days after an instance is deleted. Learn more about creating Cloud SQL instances. Learn about creating MySQL users and databases for your Cloud SQL instance. See Cloud SQL pricing information.